2. Sidney and his friends give Billy a colorful nickname that sticks with him throughout the entire movie. What do they call him? 4. Billy's girlfriend Gloria is obsessed with being a contestant on what game show? 5. Why do Gloria and Billy have the Stucci brothers chasing after them? 6. Billy and Sidney hustle a man named Ray, who isn't too happy about losing his money. What does Ray promise to do to everyone on the basketball court? 7. Billy obviously has no trouble listening to _____, but according to Sidney, he can't hear him. 8. Billy and Gloria get into a really big fight in bed over what? 9. Sidney and his wife's relationship is not without problems. Sidney's wife has a constant request and complaint to Sidney. What is it? 10. Billy has made one point crystal clear. Real men don't what? 11. Gloria goes over Sidney's house demanding Billy's money back. She says, "Teammates can't hustle each other - it's not ______." 13. Billy has a great strategy for the tournament. What is is great plan? 14. 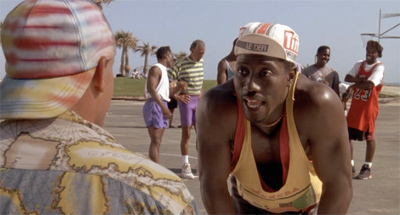 The movie is called White Men Can't Jump. But what is Sidney actually implying Billy can't do? 18. Gloria's stand-out performance on Jeopardy is in what category? 19. What does Billy usually do in the way of a apology for Gloria? 20. Gloria gives Billy some of her winnings from Jeopardy to do what with? 21. What tragedy has befallen Sidney to make him ask for Billy's help? 22. Why does Gloria leave Billy for good? 23. What are the names of the basketball legends Billy and Sidney play against? 24. What do the Stucci brothers do to humiliate Billy further after he has paid them? 25. What is Sidney's ultimate advice on relationships?